Having your work displayed in the most important center for contemporary art in Florence during your study abroad experience at LdM? This might seem a bit surreal, but for our students from the Advanced Painting course this soon will become reality. ‘Boundary Line’ is the name of the special program that makes this thrilling opportunity possible. It revolves around the same theme of the current exhibition ‘Unstable Territory, Borders and Identity in Contemporary Art’ at CCC La Strozzina. 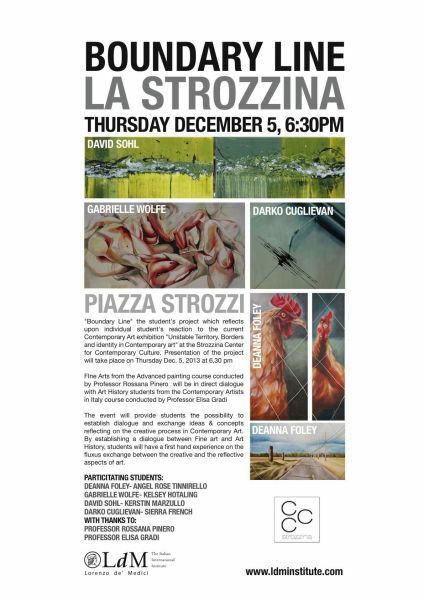 Everybody is more than welcome to join us on Thursday, December 5th at 6.30 pm at La Strozzina in Palazzo Strozzi.